Indulge your body and spirit on a 6 day/7 night yoga retreat at the world-renowned Perivolas Hotel in Oia, Santorini, Greece. Hosted by long-time friend of the hotel, Andrea Raisfeld of Bedford, NY, and taught by the inspiring and intuitive who happens to be my favorite yoga instructor Alison Aronson of O2 Living Cross River and the Saw Mill Club Mount Kisco, the Perivolas Yoga Retreat explores of the basic elements of human existence—air, fire, water, earth, and ether—all of which combined in a powerful way to create the landscape and views for which the volcanic island of Santorini is so famous. 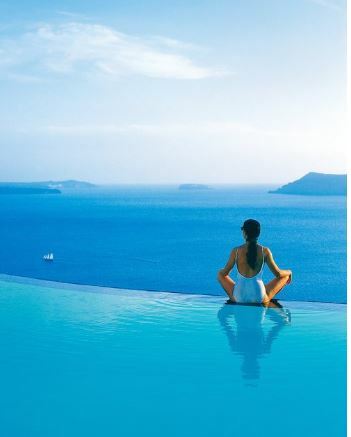 With morning and late afternoon classes, and daily opportunities like a catamaran boat trip, a hike along the Caldera, candlelight meditation, and lunch at a beloved port-side taverna, the retreat is a curated “best of Santorini” experience, while still leaving plenty of free time to lounge beside Perivolas’ iconic infinity pool or inside the hot tub, shop, and investigate the myriad wonders of this Aegean gem. Included in the retreat is private lodging in a gorgeous white cave suite, a delicious daily breakfast, two gourmet dinners, a taverna lunch, boat excursion, hike, spa treatment, t-shirt and tote, transfers and gratuities. Sign-up is now for the May 3 – 10, 2019 event, with 15 places, men and women welcome! Yoga ALL LEVELS. A $250 signing discount applies through mid-January, and registrants will receive a gift of William Abranowicz’s Hellas to whet your appetite for the wonders of Greece! This entry was posted in Travel and tagged oia, Perovolas, samtorini, yofa retreat, yoga, yoga retreat. Does age affect your sleep pattern?